This gas is obtained by carbon oxidation, which usually happens in combustions and airless conditions, for example when in domestic spaces such as rooms with stoves there is lack of ventilation. Carbon monoxide consists of one atom of oxygen and a carbon one. There is a triple bond and as it is clear from the picture the oxygen atom shares 4 electrons with the carbon, whereas the carbon shares 2 of them, resulting in one dative bond and in two covalent bonds. CO is a colorless, tasteless and odorless gas and it’s toxic for humans, because of its capacity to make irreversible bonds with hemoglobin, especially during incomplete combustions. The reason why CO is a toxic gas is that it has high affinity for hemoglobin (200 times more than oxygen), and high concentration of CO in inspired air facilitates its stable bound with hemoglobin (carboxyhemoglobin), and leads to scavenge oxygen. The capacity of oxygen transport and release is reduced and that’s why hemoglobin dissociation curve is shifted to the left. In this graphic it’s noticeable that CO is diffusion-*dependent*, in fact its bond with hemoglobin is so easy that its partial pressure is always low. In the last years, studies have revealed many aspects of endogenous production and physiological functions of carbon monoxide (CO). The majority of endogenous CO is produced in a reaction catalyzed by the enzyme heme oxygenase (HO). The first reaction of heme breakdown pathway is catalized by heme oxigenase, which cuts the bond in carbon alfa, thank to cofactors: 3 O2 and 3 NADPH. This reaction leads to the opening of the structure, which passes from a circular to a linear form, now called biliverdin, and production of 3 molecules of H2O (not drawn in the picture). During this process, it takes place the elimination of Fe3+, NADP and CO. CO production is specifically derived by the liberation of the metinic group. This biochemical pathway generally takes place in the macrophages of the spleen, but it happens as well in neuronal system, where CO (such as NO) has a major role as gasotransimitter, using as second messenger cGMP. There are three isoforms of HO: inducible HO (HO-1) and constitutive HO (HO-2) are mostly known for their roles in the oxidation of heme and production of CO and biliverdin. HO-1 production is highly regulated by several stress conditions, such as mechanical stress, hipoxia, angiogenesis, hyperoxia, termic shock, UV exposition and H2O2. The major production of HO is found in oxidative stress conditions: in fact, HO is used as a marker to detect if the stress is oxidative or not. Constitutive form, HO-2, is always expressed, particulary in brain and testicules. The biological function of the third HO isoform, HO-3, is still unclear. HO’s function is inhibited by Sn-Protoporphirin and enhanced by heme. The primary structure of HO-1 and an HO-2 fragment of 91 amino acid residues show only 58% homology, but share a region with 100% secondary structure homology. Moreover, although the three different forms presented a highly dissimilar range of expression, with HO-2>HO-1>HO-3, all of them demonstrated high level of expression in the cerebellum and the hippocampus, showing in a different scale, a strikingly parallel distribution gradient. Besides the well known poison effects of CO, there are also physiological ones: CO has many roles in the whole human body, involving especially neuronal, cardiac, respiratory and gastrointestinal system. In this essay we would like to focus on its role in blood vessels. In the past 30 years a lot of researching has been done about the role that CO has in vascular contractility. Most of it have been carried out on guinea pigs, especially in rats blood vessels, such as tail arthery, coronary artheries and thoracic aorta, but also on other animals such as rabbits. -	when HO’s activity was upregulated, the increase of CO induced a relaxation of the vase. The enhancement of HO’s activity is due to the addition of hemin (Wang et al., 1997) in the blood content in the artery and this effect is as well observed in vessels in where contraction is tried to be induced by phenylephrine. -	a inhibition of HO with metalloporphyrins resulted in an augmented perfusion pressure (seen in rat liver, Suematsu et al., 1994) and diminuted vase diameter in pressurized muscle arterioles (Kozma et al., 1999). Moreover, in the experiment of Wang we can find the evidence that when oxyhemogobin is given its bond properties lead to scavenge CO and consequently abolish hemin-dependent vasorelaxation. This same situation is found when ZnPP is given to inhibit HO. All of this effects were observed in presence of endogenous CO. On the contrary, exogenous does not provide the same results (except a case in rat muscle). Among mechanisms responsible on vasodilation, one of the most studied and verified is CO interaction with K+ channels; it is in fact demonstrated that CO interacts with the alpha subunit (or with histidine residues) of BKCa channels, leading to their opening. This pathway is not connected with cGMP, which is demonstrated by the fact that CO induced vasorelaxation may be inhibited by both operating on cGMP or pharmacologically closing the K+ channels. Leffler and others, in 1999, studied these two separated ways and they arrived to conclusion thank to selective inhibitions of K+ channels and cGMP ways: respectively, K+ channels have been inhibited by TEA and iberiotoxin, whereas cGMP pathway has been blocked by ryanodine1. Even if they have been studied as different mechanisms, it should be pointed out that cGMP has a permissive effect on K+ channels activation by CO. Moreover, vasorelaxation is surely mediated by NO as well, which acts on the endothelium of the vases. Besides CO acute effects there also some cronic ones: when CO is given for 3-week at 530 ppm in a pulmonary artery smooth muscle cell (SMC), it leads to hyperpolarized membrane potential and enhancement of the iberiotoxin-sensitive whole-cell outward current without changing the membrane capacitance. Moreover, there is an increase of K+ channels sensitivity to Ca2+, which allow them to play a major role on controlling the resting potential of the SMC. As an example of vasorelaxation, we can consider the action of CO in digestive system, which has been studied in rats and canine intestine. The CO’s effect, both direct and by cGMP, leads to an hyperpolarization of the cells resting membrane potential. Since depolarization is what makes cell contraction happening, an inversion of the potential of course leads to relaxation. 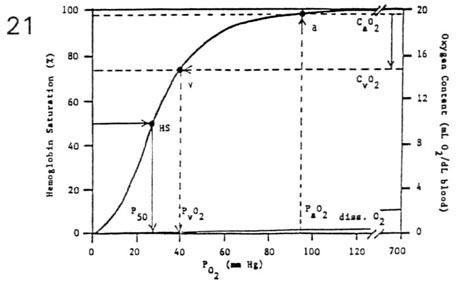 In particular, a study conducted in 2003 consisted in a comparison of the levels of CO (measured with gas chromatography), the activity of HO (with bilirubine) and the measure of membrane potential (with electrophyisiology) both in presence and absence of HO. Since in gastrointestinal system there is a gradient in membrane potential across the whole thickness of the circular muscle that allows many states of contraction from none to the maximum, it is important to evaluate factors that regulate this particular aspect. In hemeoxygenase-2-null-mice membrane is depolarized, leading to lose the normal regulation of gradient in the thickness of the intestine; moreover this phenomenon was observed only in the intestine and not in other tissues. Because of this fact, it is clear the role that HO - and so CO - plays in the control of vasorelaxation, in fact there are specific intestinal cell specialized in HO-2 production: interstitial cells of Cajal. Regions of the canine gastrointestinal tract that are more hyperpolarized generate more CO and have higher heme oxygenase activity than more depolarized regions. Another region where CO behaves as a dilator is brain: especially, there is a study (Kanu, Whitfield, Leffler, 2006) about piglets arterioles. The aim of the study was to find out if endogenous CO contributes in vasodilation in hypotension situations. Researchers took some hypotensive piglets and somministrated them HO substrate, heme-L-lysinate (HLL), which caused dilation of pial arterioles. In particular, hypotension (50% of basal blood pressure) increased cerebral CO production and dilated pial arterioles from 66±2μm to 92±7μm. This experiment has been confirmed by helding stable levels of NO and prostacyclin (dilators) and by observing that anything changed from the previous experiments in which no clamp has been made. So the results of the study suggest that CO production has a role in cerebrovascular dilation in hypotensive conditions. In both these examples it is appreciable the physiological role of CO as vasodilator, which is a less known peculiarity of this gas. Why does ryanodine (which is able to block Ca channel) in sarcoplasmic reticulum leads to diminution of vasorelaxation? Because, as it is noticeable in the diagram, Ca makes NOS to produce NO, which, bounded to sGC, allows it to transform GTP in cGMP. cGMP itself then actives PKG, which phosphorilates the light chain phosphatase, making it active. The light chain is dephosphorylated and it does no longer interact with actin: so, the result is smooth muscle relaxation and vasodilation. Obviously, a diminution of [Ca] interrupts this pathway.